Cryptomarket had a dramatic start with the unprecedented bulls from 2017 coming to rest, losing over 60% of total market cap value in just a month of January. Further, 2018 was even more pessimistic with the downward crypto market trends. 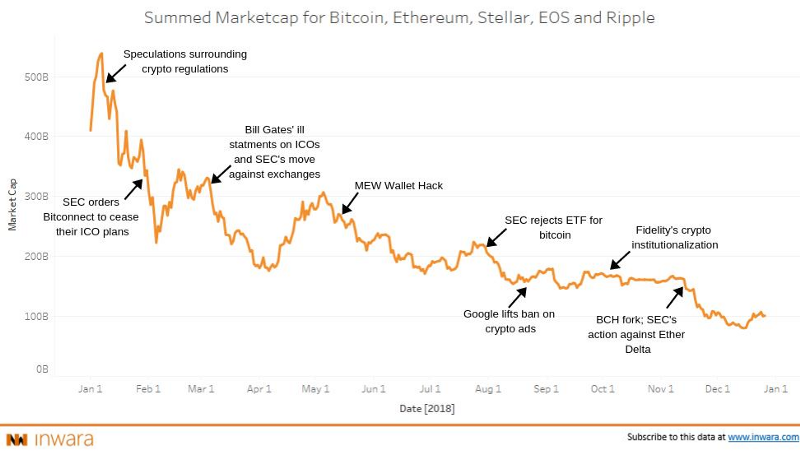 On the brighter side, the crypto market is on its way to reaching the maturing phase surpassing the FOMO and FUD stages. InWara’s study covers such these significant trends in the ICO and the STO universe. This study further presents pragmatic views on the crypto market which, according to experts, is poised to make some major moves over the next year. InWara provides insightful analysis based on institutional-grade ICO/VC data to give retail and institutional investors a clear assessment of the current trends and developments in this space. USA sustains the top position with 60% spurt in ICO numbers (YoY). Interestingly UK and Singapore have seen over 180% growth in the number of ICOs (YoY). With Singapore in the second position and China showing over 100% growth in 2018, Asian markets exhibit a promising future for cryptos. 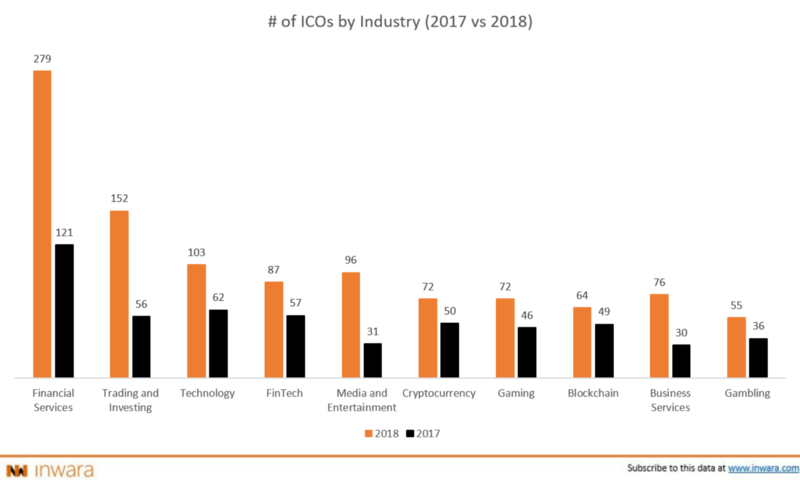 Financial Services remains the most popular sector in 2018 with over 130% growth in the number of ICOs from 2017. Media and Entertainment sees significant growth with multiple crypto-based funds springing up in 2018. The number of ICOs listing on the exchanges has seen a significant drop in with less than 20% of ICOs seeing the listing in 2018. Just 15% of ICOs have been listed in exchanges during Q4 2018, posing a serious concern for the investors, as they could be stuck with tokens and no liquidity. Security Tokens (STOs) are essentially tradable assets subjected to federal regulations and compliances. In general, investors are expecting the STOs to deliver better RoI with fewer risks in the long run. Security Tokens gained momentum over ICOs especially with compliance matters addressed favorably by regulatory bodies such as SEC in USA and FSC in South Korea. SEC went hard on fraudulent activities (e.g. Paragon and Airfox) and that has cautioned serious players planning to raise funds via digital tokens. Overall, the erosion in investor confidence has prompted the investors rather prefer STOs. Investments and Trading lead the token offerings with over 20% of total STOs. Financial Services, which lead in ICOs, now stands third after Technology. Detailed analysis of every event is covered the full 40-page report. Q4 2018 has seen over 65% dip in funds raised and VCs and institutional investors taking a step back in this market bear. 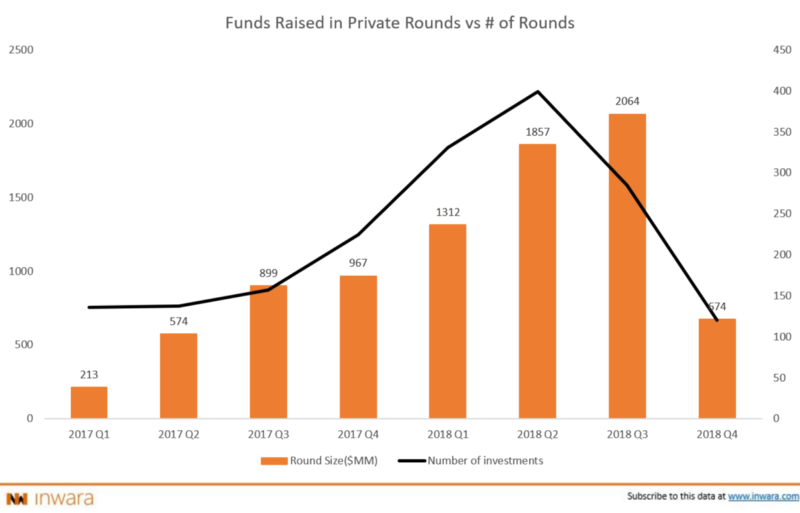 However, private funding has seen significant growth in 2018 with total funding rounds doubling as compared to 2017. Existing players move out as fear sets in! Digital Currency Group has been consistent with investments even in the sluggish 2018 market while all others took a breath. However, 2018 have seen some new entrants such as Kosmos Capital, Neo Global Capital and more investing in cryptos. Positives include almost all of the players have raised Crypto-focused funds in 2018 and have attracted the best of talent in Financial markets. 2018 has seen over 90% surge in crypto and blockchain related mergers and acquisitions. This major upswing is credited to the crash of Bitcoin (BTC) by over 50% lower than at the start of the year. VCs, Institutional investors and entities with deep pockets saw the bear market as an opportunity to ante up in future technologies that could perhaps break the banks. Circle, a company that adopts blockchain technology with a vision to make Bitcoin more accessible acquires one of the biggest exchanges, Poloniex in Feb 2018 for $400 million. By Acquiring Poloniex Circle is expecting to address solve the issues related to reliability and bolster the existing scalability, hence improving the robustness of the platform. This executive summary provides only 15% of analysis of the complete 40-page annual report. Get the priority edition of InWara’s annual report here. Please submit your details below. We'll email you the report!